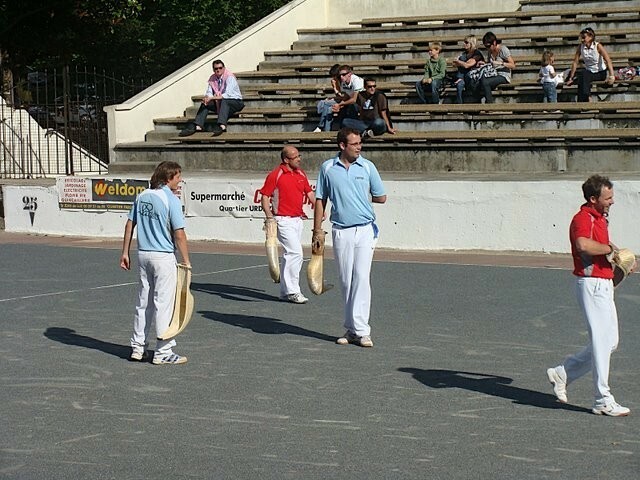 Grand Chistera (pelotte with the arm extended by a cane basket) is like team-squash played in the open air. It is a fast-moving & energetic game. Pelotte is a game not unlike squash but using open air on pitches of various lengths depending on the which particular variant of the game is being played. It is the national sport of Valencia (the autonomous region of Spain) and is played widely in South America; it remains unclear whether European adventurers took the sport to South America or whether the sport migrated the other way. There can be two, four or six players depending on the verion of the game being played, but in all cases the aim is for alternate players from opposing sides to hit the ball directly it rebounds from the front wall (or with no more than a single bounce off the floor or back wall). Originally it was played with bare hands against a wall (fronton) and this is the most natural game because it does not require special kit. However, these days it is mostly played with wooden bats in the open air. Well-maintained frontons can still be seen in the main square of almost every town and village throughout Les Landes. In the chistera version of the game a much longer playing area is used – typically 50 metres. Grand chistera is a particularly exciting spectator sport (there is an arena in Hossegor) which is played in an “open-air” fronton of at least 80 metres in length but with the addition of a small rear wall (very like squash). The teams wear an arm extension made of cane and leather in order to (quite literally) add power to their throwing elbow – using this basket and with a short run-up, the player can return the ball the full length of the court (roughly the length of a football pitch! ).